President Barack Obama takes his courtside seat as he attends the Cleveland Cavaliers basketball game against the Chicago Bulls at the United Center in Chicago, Tuesday, Oct. 27, 2015. 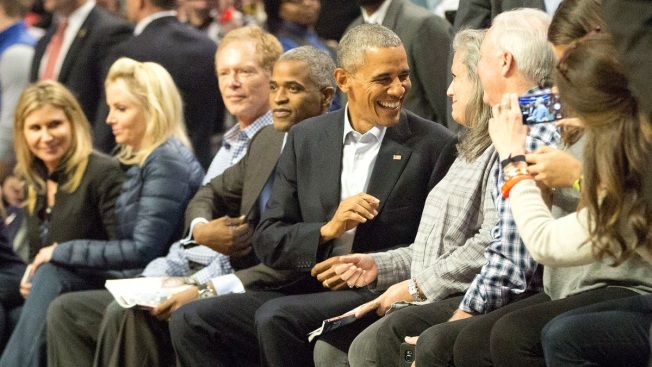 President Barack Obama has had a busy afternoon in Chicago, but apparently that didn’t stop him from attending the Bulls' season opener at the United Center Tuesday night. The presidential motorcade arrived to the United Center, where the Chicago Bulls are playing LeBron James' Cleveland Cavaliers in the first game of the season. Secret service at the United Center this morning. All signs point to POTUS being at the Cavs-Bulls game tonight. Heavy security at the United Center. Possible a certain president will be attending #Bulls game. With Derrick Rose starting and James coming to Chicago for an Eastern Conference semifinals rematch, Obama's appearance adds even more excitement for fans attending the highly-anticipated game.